Throw to the inside of the pole to increase your odds of connecting. 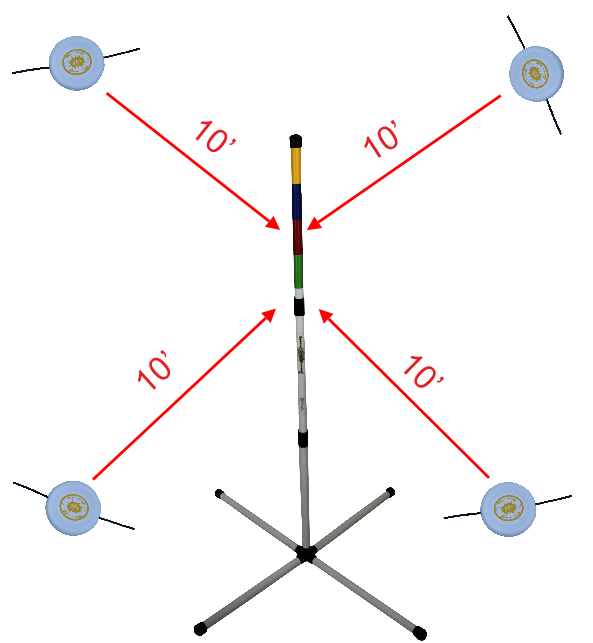 Click on the video below to see how to position the disc for a successful connection with the pole. If you catch the pole you get 1 point. If you match the color on the disc to the color on the pole you get 2 points. A black widow happens when the player wraps both legs around the pole. If you perform a black widow you are awarded two points. Game Instructions: A round consists of each player throwing all four spider discs. The thrower lines up 8 to 10 feet away from the pole. 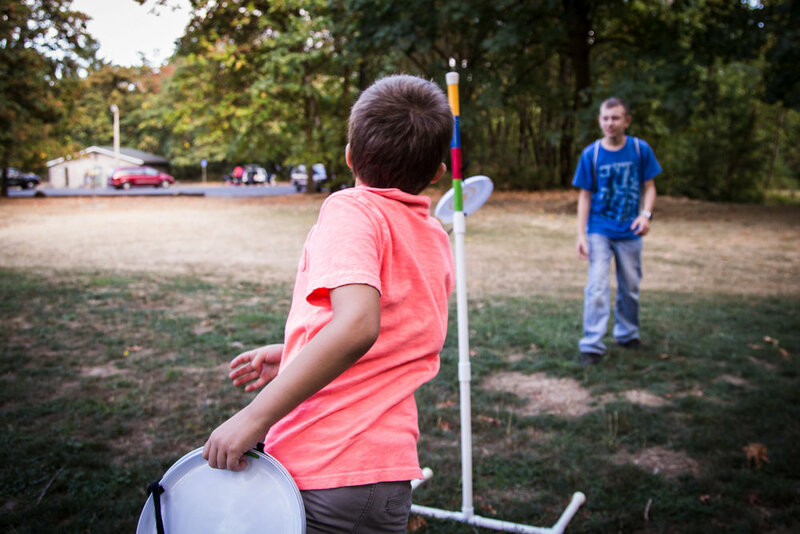 A player cannot remove the disc from the pole until their turn is over and it is the next player's turn. If a disc falls off, that player loses the points from that disc. The player who is not throwing is the receiver and gathers the missed throws. The receiver stands no closer than ten feet behind the pole. If the receiver catches two missed throws in a round, the receiver earns a point. Players alternate turns until someone reaches 11 points. This game requires more strategy than team play. Each player gets two discs. Divide the discs up evenly among the players. Players alternate each throw instead of each round. 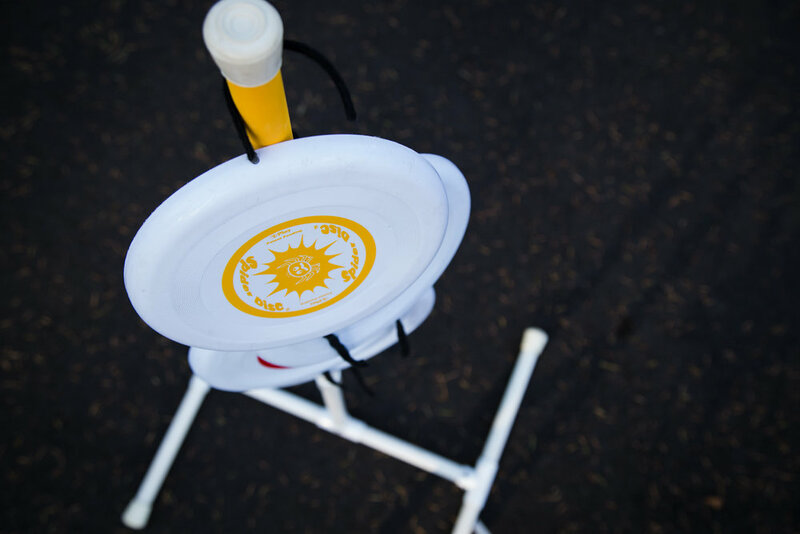 Each player will still throw a total of four throws but this will spice up the game by giving players the ability to knock off an opponent’s disc or block the colors depending on where your disc hangs. Players should alternate which color discs they throw each round. Seven points wins the game. Game Instructions: Each player positions themselves equally around the pole. Each player throws their disc at the same time. Whoever catches the pole wins and advances to the next round. If you catch your color, you win unless another player catches their disc. All players who catch the pole advance to the next round until there is only one winner. Game Instructions: Spider Golf uses the same rules as golf but with a few exceptions. You can design your course big or small by placing the pole wherever you want. There are two unique throws that are utilized in Spider Golf: the driver throw and the fairway throw. To perform the driver throw, fold the legs under the disc and attach them to the Velcro on the underside of the disc. For the fairway throw, fold one leg only under the disc and attach to the Velcro on the underside of the disc. You only get to use each of these throws once during the course. The driver throw is best for long distances and the fairway throw is for mid-range distances. Another unique feature of Spider Golf is the par system. If you catch the pole, it is like hitting the ball into the hole but if you hit the color that relates to the color of your disc you get a -1 point. Example: on a par 3 you could catch the pole in 4 but, if you hit your color it reduces your score to par 3. Game Rules: Place the pole at one end of the battle field. Each team gets four chances to score points. 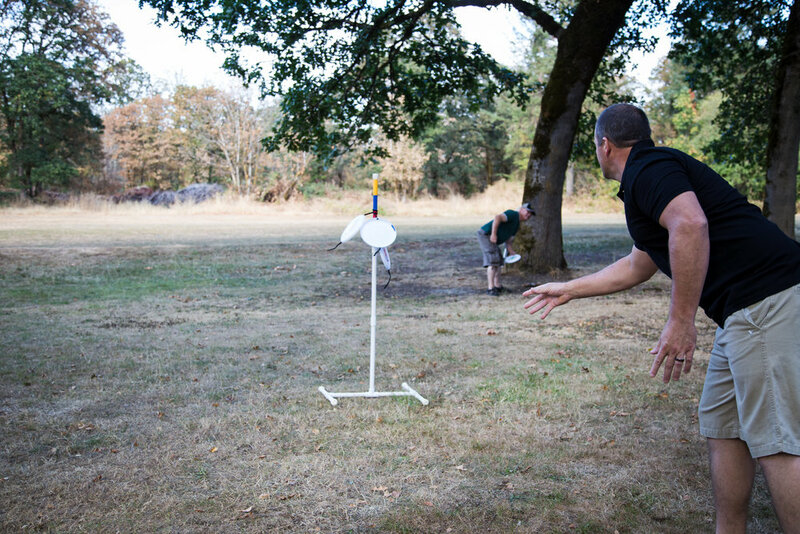 The attacking team picks one of the four color discs to throw and advances down the field toward the pole. Once they throw all the discs, it is the other team's turn. A round is complete once both teams have thrown all 4 discs. A game consists of four rounds. The defending team can free roam and can only block the disc from catching the pole. The offensive team only gets three steps while holding the disc and then has to pass or attempt a shot. The disc is in play as long as it does not touch the ground or is in the advancing team's hands. 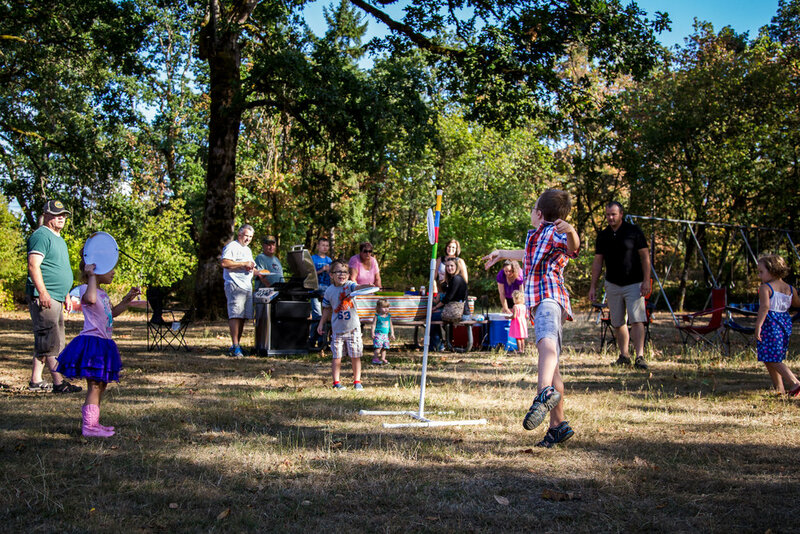 No player can hover in front of the pole and the attacking team has to attempt a throw no closer than eight to ten feet from the pole. If a team scores a point, they also get a free throw to get an additional point. The additional throw is done from ten feet away and has to catch the disc's color to get the point. The defending team can taunt and yell to distract the player throwing. Throwing too close to pole: The offensive team must release the disc from their hand in order to score. 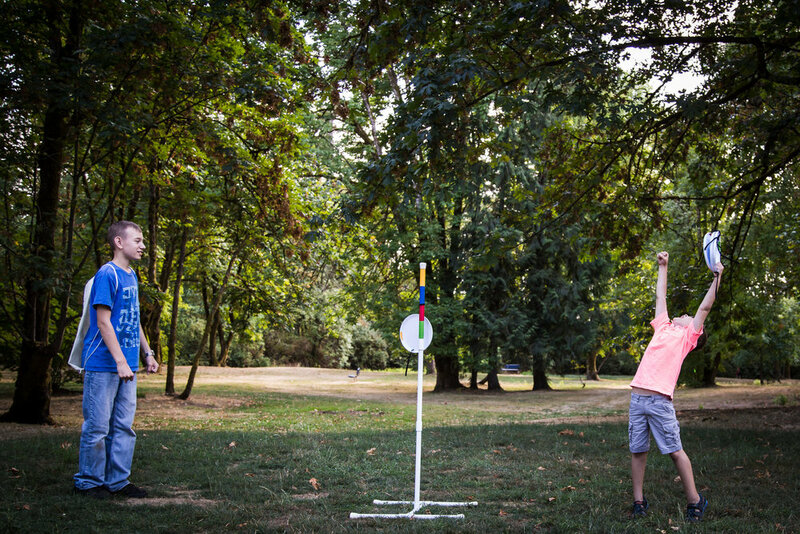 The player may not place the disc on the pole, even if the pole is within arm's reach. 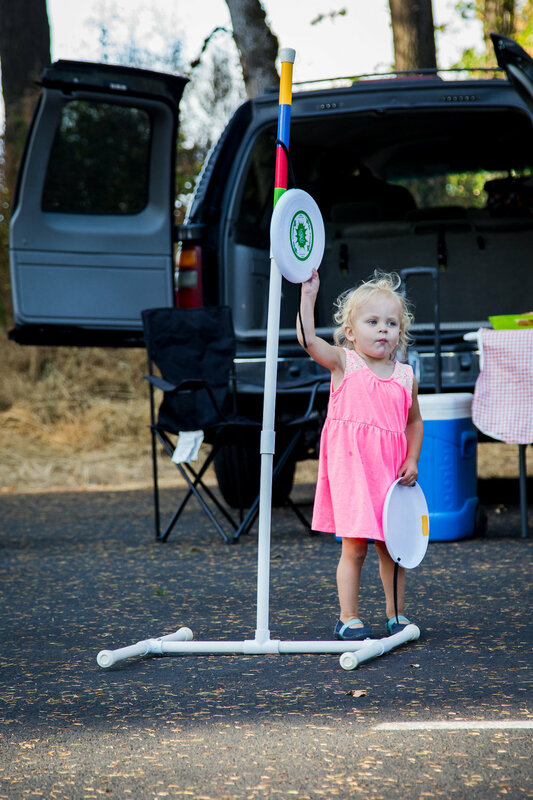 Taking more than three steps: If you have the disc, you can only take three steps then you must pass or attempt a point shot. After three penalties, the defending team gets a free throw from ten feet away. Unnecessary aggression penalty: Any unnecessary aggression will result in a penalty throw for the opposing team. 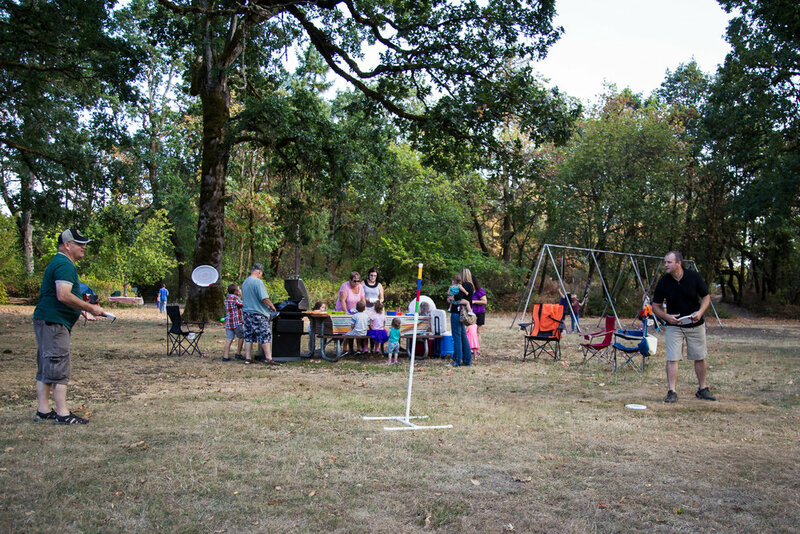 Camping: If a defensive player is caught within five feet of the pole trying to block it, the offensive team gets a free throw. Game Instructions: Same rules as Horse. One or two poles can be used. In S-P-I-D-E-R, the object is to be the last to accrue the five letters in the word "spider". The throws in S-P-I-D-E-R can be trick throws and/or lucky throws designed to make the other person miss. In S-P-I-D-E-R, player #1 is allowed to throw from anywhere on the field. If the player catches the pole, then player #2 must duplicate the same shot from the same position. If player #2 misses, he/she receives the first letter from the word spider. 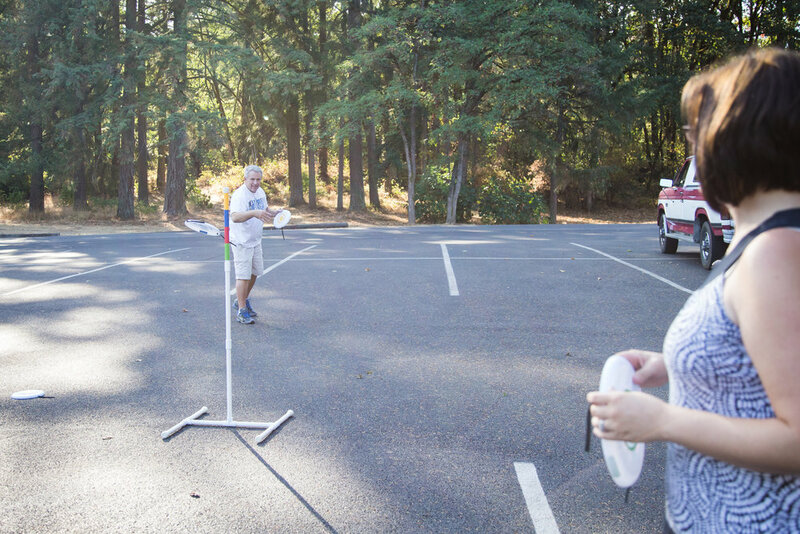 If player #2 makes the shot, no letter is given to either player, player #2 receives control of the disc, and he/she can select a new shot from anywhere on the field. If player #1 missed his original throw, then player #2 would also be free to throw from anywhere on the field. In either case player #2 selects a new throw, the play proceeds as before. If he/she makes it, it forces the next player (player #1 if there are only two players; or #3 if there are more than two players) to try and duplicate his made throw; should he/she miss, the next player has a free throw selection. The first player to spell S-P-I-D-E-R loses. Game Instructions: Same rules as Around the World. Played by two or more players, who have all agreed upon a turn order. The game requires a sequence of throwing at positions to be decided upon by the players. 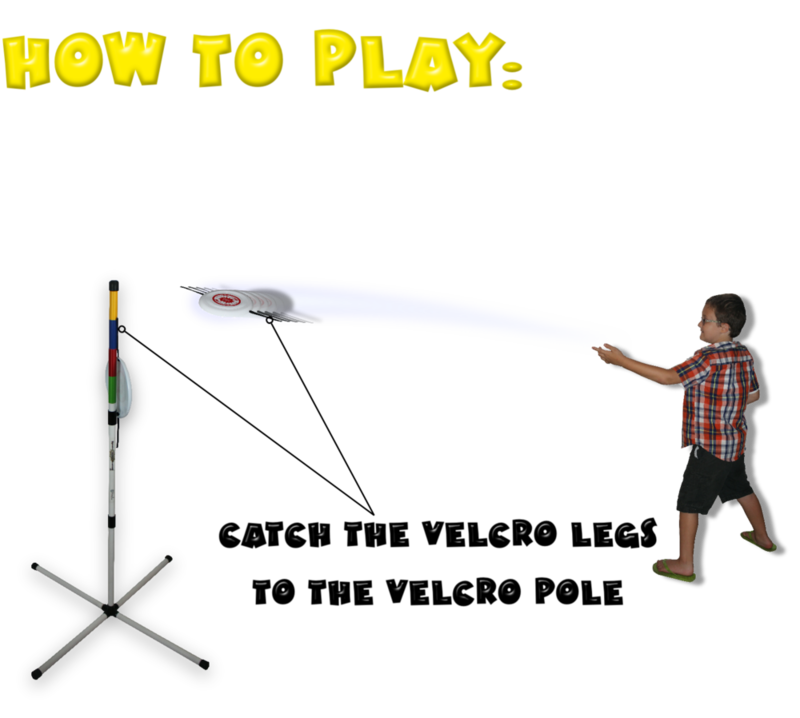 The object is to be the first player to catch the pole from all positions. Making a throw from a position allows a player to advance to the next position. The rules are very flexible, but usually a player keeps advancing until a missed throw. A missed throw requires the player to start over at the first position. Under this version of play, a player can "save" their position and pass the turn to the next player.